In this classic Irish legend, two harpists -- merry-hearted Old Pat and ill-spirited Young Tom -- set off for a contest to name the finest harpist in all of Ireland. When Young Tom realizes that Old Pat is truly the better musician, he schemes to be the winner -- but he doesn't reckon with the clever trickery of a mischievous little leprechaun. Noted picture book creators Pamela Duncan Edwards and Henry Cole have imagined a joyful and fanciful tale with a priceless lesson. There is a contest to find the best harpist in Ireland, and it comes down to two musicians- Tom and Pat. Pat is clearly the more talented of the two, so Tom relies on a sneaky scheme to try to win the title. His attempt fails miserably, thanks to the assistance of a leprechaun Pat befriended. 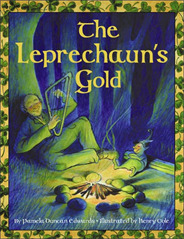 Children will enjoy the moral of this suspenseful little story, and will have fun searching for the shamrocks hidden through the book.